Want to take your next event in Winter Park up a notch, but unsure how? 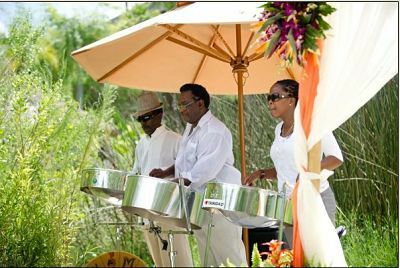 Let RythmTrail Steel Drum Band bring your upcoming wedding, birthday party, anniversary, rehearsal dinner, corporate event, or beach wedding a taste of the Caribbean with our steel drum band. We play an extensive list of music, spanning Caribbean steel drum music, Reggae, Calypso, and Soca. Enjoy the sounds of the Caribbean with our experienced steel drum players and our over 20 years of steel drum experience. All of us are native islanders from the Caribbean, and we know a thing or two about real steel drum music. Whether you need the full steel drum band, or just a solo player, trust RythmTrail to guarantee the entertainment at your next event with some of the best steel drum players in the world, and all at a price you can afford. RythmTrail isn’t limited to local events at Winter Park- we also travel to beach weddings, parties, you name it- from all over the state of Florida, across the country, even internationally! Don’t deal with the disappointment of our imitators, and trust us to give you the best steel drum music for your special day. Our music will fit the mood of any event you can imagine- romantic, upbeat, or dramatic- it’s up to you! Want even more control? We’ll even play your own favorite playlist of music and songs. But don’t delay, because our schedule fills up fast. Call RythmTrail today at 866-495-4522 or get a free quote from us online today, so we can start turning your next event into a tropical island. Jammin in Winter Park FL today at Windsong Residents Club for the residents reception. Hire the best steel drum players in Winter Park Florida.